Mornings can be rough around here. Austin leaves for work at 4am, so he's long gone by the time the kids and I wake up. Felix is teething and sleep is hard to come by, so when the kids join me in bed at 7am, I'm rarely ready to face the day. Because I'm often functioning in a half-dazed haze for the first few hours of the day, breakfast has been a challenge. I've tossed a box of dry cereal to the kids more times than I care to admit, and I rarely eat breakfast. I recently remembered about overnight oats! I made them diligently for a while, but forgot about the idea for months. It's been wonderful! I never knew oats could be life changing, but it's made such a big difference in our mornings and days! There are a million different ways to make overnight oats, and the way I do it is neither the most healthy or frugal, it's just the most convenient for me right now. I make 8-10 jars at a time, which lasts us 2-3 days. Lulu can make them almost entirely on her own. This isn't really a recipe, as I really don't know what kind of measurements I/Lulu use, but it works for us! 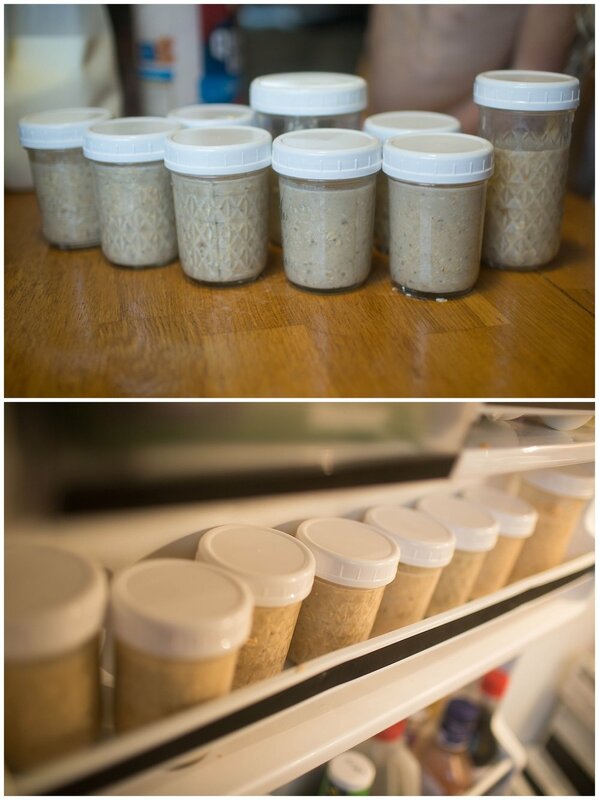 -Measure out about 1/2 cup of oats per jar. I use a mix of quick oats and rolled oats, just because that's what we have on hand currently. I then pour in milk until it's even with the dry ingredients. We've been adding peanut butter (probably a full cup) and a banana to ours and it's super tasty! I use my Kitchen Aid and mix it all up! I know some people do all the making and mixing in the jars, but I've found this is the fastest way for me to make a big batch! From here, I use a measuring cup and scoop it into each jar. I found I needed a few more jars since so many of ours are in use lately and found a bunch at Value Village for 29 cents each. If you need jars, check there first! I got the lids on Amazon. It takes us 10 minutes start to finish to get a batch in the fridge and it feels so good to know breakfast is ready for the next couple days! 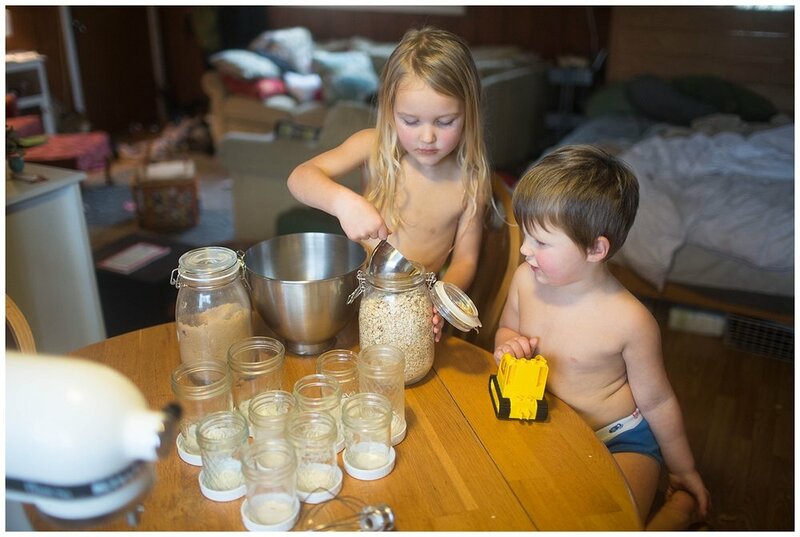 The kids each grab a jar in the morning and, after fighting over spoon choices for a few minutes, help themselves to breakfast. They rarely finish a whole jar (and they're only 8oz jars!) but they just put the lid back on and put them in the fridge, until they're ready for a few more bites. I've found that a small jar is plenty for me as well, they're super filling and so easy to grab and take along if we have somewhere to go! Again, I know there are healthier ways to make overnight oats but my goal is strictly convenience right now!